How do I stop water from wicking into the wall? I just bought a new home, and water is getting into one corner of the house. The drywall on the inside of the pictured corner is soft and there was mold under the baseboard, but no water marks are visible from the inside. The bad drywall only extends about 6 inches up from the floor. 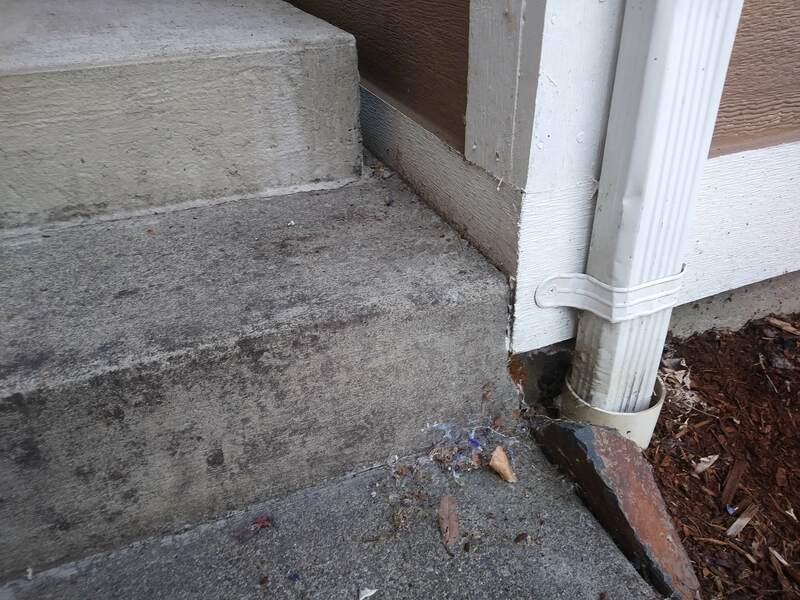 Our realtor said the previous owners poured a new step at the front entrance, and thought it was likely that the step was trapping water against the trim, and water was wicking up into the interior of the wall. Question 1: What should I check to find out if this really is the source of the water? This is the outside wall: The affected drywall is inside the corner with the gutter and along the wall by the step. I see no evidence that the gutter or downspout are leaking. When it rains, water pools in the slot by the step. A closer view: As you can see, the trim extends several inches below the step. The siding is LP (circa 1990, so not good stuff), but the trim is wood. The trim appears undamaged. Question 2: If this is the source of the water, how can stop water from infiltrating into the house? One suggestion I've gotten is to cut the trim above the step and install metal flashing. I'm not sure what I should expect to find behind the trim, nor where/how to attach the flashing. The house foundation probably extends some distance up behind the trim, but I would also expect there to be some form of vapor barrier back there which I would rather not damage. 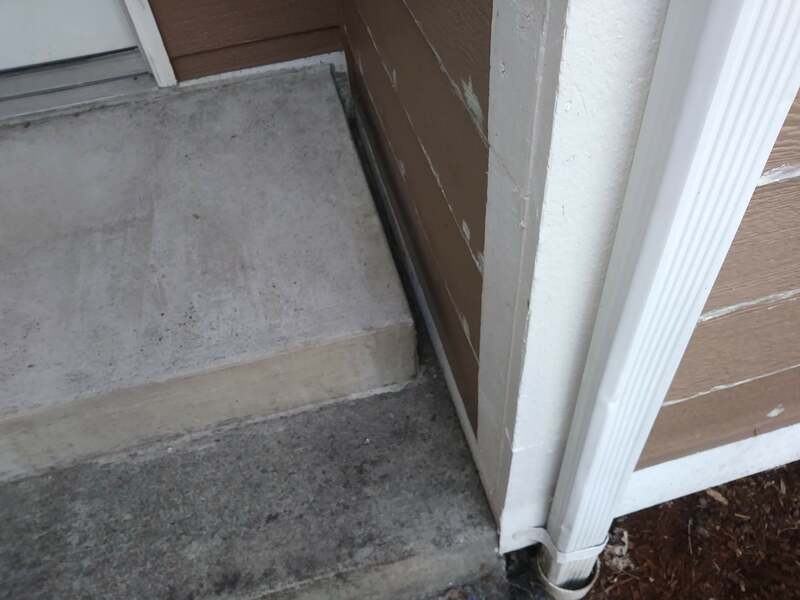 What can be done to enable proper drainage of the slot next to the step? Location is the Seattle area, so lots of low intensity rain and dampness. The house was built in 1990, and it is in good shape but the build quality isn't the highest. To answer both questions will require to have the concrete step removed entirely. The water is somehow migrating up to the floor through capillary action I suppose. To check it and fix it is still the same remedy. The step needs to be removed, downspout, as well as the siding and the corner boards. There are joints in the corner boards that will make it a bit easier to do so. No need to remove the complete corner board. Remove all the trim and siding below the door sill and in the corner that the concrete covered. Since I have been in WA state, I have seen, typically how siding is installed under doors and steps, and this appears to be no different. In MD, it was never a good idea to place concrete directly against the wood siding, or any siding for that matter. This invited rot and insects due to harbored moisture by the concrete. I don't understand why it is done this way a lot over here, but it seems the norm. Perhaps it the condition of the trade everywhere, but i only seen it here. Back at the matter. Under the siding there should some continuous barrier, galvanized metal is used a lot out this way, with a lot of nails holding it in place. which is the problem, holes in the face of the metal. This is what will need to be replaced. Even if it is not galvanized metal, this is the part that is failing, exacerbated by the steps. The replacement should be a "peel and stick", self sealing membrane that covers the whole run of siding and trim that the stairs covered. It needs to go higher than the floor level on the inside, at least by a few inches, and around the corner to meet the siding under where the downspout goes back on and seal the end with caulk to the siding and place the corner board while the caulk is still wet, to bond it all together. The trick will be the door sill, sealing that. Typically the membrane is in place before the door is set and the bottom is sealed with caulk as the door is set in place. The steps can be re-poured, but they really should be kept away from the siding to keep the trapped water problem from reoccurring. Not the answer you're looking for? Browse other questions tagged concrete waterproofing trim or ask your own question. How can I stop water from coming in through a crack near the top of my bulkhead wall? Do I need anything over the wall board around wood trimmed garage door openings? How would a professional flash this? What's the proper way to flash an inside roofing corner, with self-stick membrane? Waterproofing a concrete basement wall with a staircase in the way? Why is my wall-ceiling corner damp when it rains?